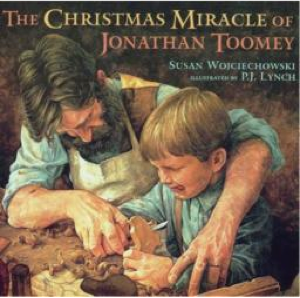 The Christmas Miracle of Johnathan Toomey written by Susan Wojciechowski and illustrated by P.J. Lynch. A tender tale of the widow McDowell and her seven year old son Thomas, who ask a gruff woodcarver to carve the figures for a Christmas crèche. Ages: Suitable for ages 5 and up.